Are you currently seeking an implant dentist near Galleria? If so, chances are good that you’re not the only one. In fact, the American Academy of Implant Dentistry, or AAID, claims that approximately 69% of American adults aged 35 to 44 has one or more missing teeth. Whether you’re looking for a single tooth replacement, fixed bridges or partial dentures for multiple teeth replacement, or a full arch replacement, the Galleria Dental team can help you with the dental implant solution that best suits your needs. Our implant dentists near Galleria and greater Houston are skilled in restoring missing or damaged teeth. The effect they skillfully create makes it appear as if your dental implants are part of your natural smile. Strangers and casual acquaintances will be none the wiser, while even family members and close friends will be fooled as the implants mimic the look of real teeth. In learning more about Galleria Dental’s prosthodontic and dental implant services, you’ll discover how safe our procedures are as well as the various ways in which dental implants can enhance the quality of your life. Why Choose Galleria Dental Implants? Galleria Dental is an ideal choice for those considering an implant dentist near Galleria. In a nutshell, dental implants are a permanent solution for missing teeth that are seamlessly integrated with and supported by existing teeth. Dental implants are usually made of a biocompatible material such as titanium that the body naturally accepts and isn’t harmful to existing tissue. These implants are surgically installed by a prosthodontist who has completed up to four years of additional dental school training. We recognize that emergencies will occur that require an implant dentist near Galleria as soon as possible. 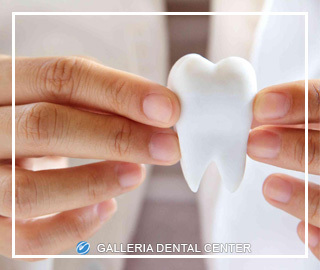 Galleria Dental does its best to ensure that all patients with tooth injuries and dental pain get to meet with a member of our qualified prosthodontist and dental specialist staff. All calls and online inquiries are promptly handled so that you receive the help you need for your dental issue. In a nutshell, Galleria Dental should be your top choice for implant dentists near the Galleria district. Call today at (713) 960-9926 or click the link to schedule an appointment for a dental implant procedure. We look forward to hearing from you soon!